Cheers is dedicated to delivering hospitality professionals the information, insights and data necessary to drive their beverage business by covering trends and innovations in operations, merchandising, service and training. 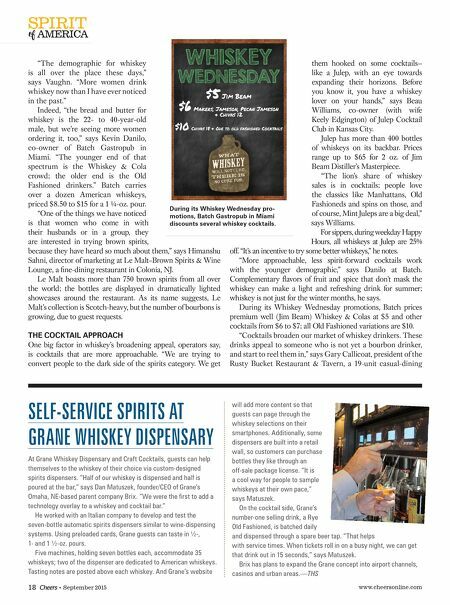 www.cheersonline.com 18 • September 2015 SELF-SERVICE SPIRITS AT GRANE WHISKEY DISPENSARY At Grane Whiskey Dispensary and Craft Cocktails, guests can help themselves to the whiskey of their choice via custom-designed spirits dispensers. "Half of our whiskey is dispensed and half is poured at the bar," says Dan Matuszek, founder/CEO of Grane's Omaha, NE-based parent company Brix. "We were the first to add a technology overlay to a whiskey and cocktail bar." He worked with an Italian company to develop and test the seven-bottle automatic spirits dispensers similar to wine-dispensing systems. Using preloaded cards, Grane guests can taste in ½-, 1- and 1 ½-oz. pours. Five machines, holding seven bottles each, accommodate 35 whiskeys; two of the dispenser are dedicated to American whiskeys. Tasting notes are posted above each whiskey. And Grane's website will add more content so that guests can page through the whiskey selections on their smartphones. Additionally, some dispensers are built into a retail wall, so customers can purchase bottles they like through an off-sale package license. "It is a cool way for people to sample whiskeys at their own pace," says Matuszek. On the cocktail side, Grane's number-one selling drink, a Rye Old Fashioned, is batched daily and dispensed through a spare beer tap. "That helps with service times. When tickets roll in on a busy night, we can get that drink out in 15 seconds," says Matuszek. Brix has plans to expand the Grane concept into airport channels, casinos and urban areas.—THS of SPIRIT AMERICA "The demographic for whiskey is all over the place these days," says Vaughn. "More women drink whiskey now than I have ever noticed in the past." Indeed, "the bread and butter for whiskey is the 22- to 40-year-old male, but we're seeing more women ordering it, too," says Kevin Danilo, co-owner of Batch Gastropub in Miami. 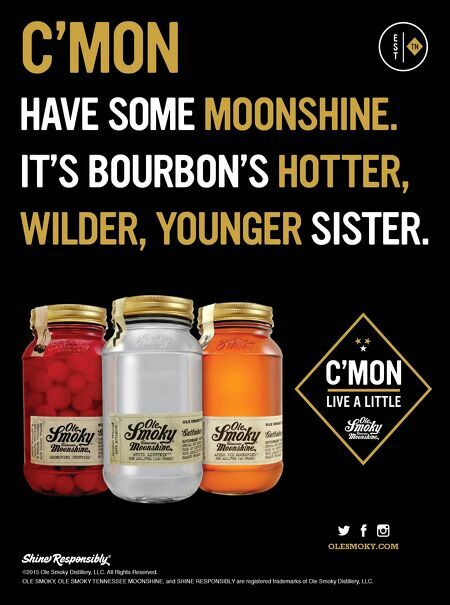 "The younger end of that spectrum is the Whiskey & Cola crowd; the older end is the Old Fashioned drinkers." Batch carries over a dozen American whiskeys, priced $8.50 to $15 for a 1 ¼-oz. pour. "One of the things we have noticed is that women who come in with their husbands or in a group, they are interested in trying brown spirits, because they have heard so much about them," says Himanshu Sahni, director of marketing at Le Malt–Brown Spirits & Wine Lounge, a fine-dining restaurant in Colonia, NJ. Le Malt boasts more than 750 brown spirits from all over the world; the bottles are displayed in dramatically lighted showcases around the restaurant. As its name suggests, Le Malt's collection is Scotch-heavy, but the number of bourbons is growing, due to guest requests. THE COCKTAIL APPROACH One big factor in whiskey's broadening appeal, operators say, is cocktails that are more approachable. "We are trying to convert people to the dark side of the spirits category. We get them hooked on some cocktails— like a Julep, with an eye towards expanding their horizons. Before you know it, you have a whiskey lover on your hands," says Beau Williams, co-owner (with wife Keely Edgington) of Julep Cocktail Club in Kansas City. Julep has more than 400 bottles of whiskeys on its backbar. Prices range up to $65 for 2 oz. of Jim Beam Distiller's Masterpiece. "The lion's share of whiskey sales is in cocktails; people love the classics like Manhattans, Old Fashioneds and spins on those, and of course, Mint Juleps are a big deal," says Williams. For sippers, during weekday Happy Hours, all whiskeys at Julep are 25% off. "It's an incentive to try some better whiskeys," he notes. "More approachable, less spirit-forward cocktails work with the younger demographic," says Danilo at Batch. Complementary flavors of fruit and spice that don't mask the whiskey can make a light and refreshing drink for summer; whiskey is not just for the winter months, he says. During its Whiskey Wednesday promotions, Batch prices premium well ( Jim Beam) Whiskey & Colas at $5 and other cocktails from $6 to $7; all Old Fashioned variations are $10. "Cocktails broaden our market of whiskey drinkers. These drinks appeal to someone who is not yet a bourbon drinker, and start to reel them in," says Gary Callicoat, president of the Rusty Bucket Restaurant & Tavern, a 19-unit casual-dining During its Whiskey Wednesday pro- motions, Batch Gastropub in Miami discounts several whiskey cocktails.